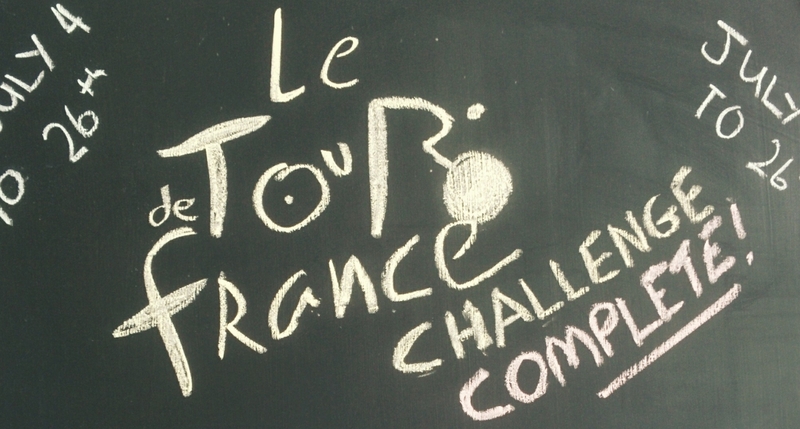 As Chris Froome made history with his second Tour win, our Tour de France Challenge came to a climax too. The enthusiasm and competitiveness that has been shown by you all over the past few weeks has been amazing to see. The times on the 2km time-trial leaderboard continued to tumble right up to the final ride whilst the number of Tour de France Challenges that we sold was beyond our expectations – so thank you for getting so involved and embracing the Burn! In the hotly contested 2km time-trial, Flo Bailey set the fastest time for the women at 3mins 17secs, while Andy Nottingham won the men’s in the very final session with a stunning 2mins 29 secs. Flo picks up a goody bag from the lovely ladies at Sweaty Betty and Andy gets the Team Sky cycling jersey from Rapha. In the best team category, the winners were the Ross family. Sophie, Victoria and Natasha will be receiving their own personal training session with our very own instructor, Rachel Rivers. The highest TdF Challenge Burn score for the women went to Bernadette Keane, while Charlie Jones took the honours for the men. They both receive complimentary sports massages from Mark Stanton who is also offering 50% discount to all Ride Republic riders throughout August – contact us if you’re interested! We will be contacting all the winners individually – but thanks again to everyone who got involved.